I'm sending a fabric sample printed with the free shapes to new-to-Inklingo quilters! (USA & Canada only) Please put "free fabric sample' in the comment on your order. Normally, address is optional on free orders but of course, I need it if you want the fabric sample. I made some great shapes available for FREE. Since they are downloads, you can start now. It is just like placing a normal order (add to cart, check out), except that it is free, so you will not be asked for payment information. Inklingo for Beginners (below) answers some basic questions. The info in my Welcome Email guides you through the first steps. If you don't receive a welcome email soon after you place your order, please check your spam or junk folder or visit that page online. Inklingo is a simple and economical way to save time and make better quilts by machine or by hand, pieced or appliquéed. 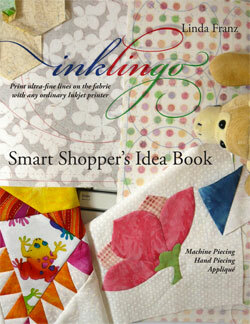 Inklingo uses digital files (PDFs) to print shapes on fabric with any ordinary Inkjet printer. Inklingo replaces measuring tools and templates. It is so innovative it is patented! It allows you to cut with scissors, or cut several layers at a time with a rotary cutter. It allows you to make simple or complex designs more easily. 2. WHAT FABRIC CAN I USE? Almost any cotton quilting fabric is suitable for Inklingo. When it is ironed to freezer paper, it goes through a printer safely, just like paper. The 20 different colors of Inklingo ink which are used in the PDFs will show on almost any fabric and are likely to wash out completely. There are tips for dark fabric in The Inklingo Handbook and on the All About Inklingo blog. Any ordinary Inkjet printer allows you to print “custom page sizes” to minimize waste, so Inklingo uses fabric very efficiently. 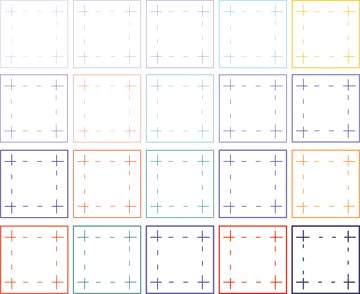 In some cases, “combo layouts” allow you to use less fabric than with traditional methods. 3. WILL THE INK SHOW? There is a simple test page with all 20 Inklingo ink colors, so you can test to be sure that the ink in your printer will wash out, and that a color does not show through the front. 4. WHAT CAN I MAKE? There are so many choices that it can be hard to decide! The Inklingo Smart Shopper’s Idea Book (free download) summarizes the shape collections which are available now and the shapes which have been requested. It complements the info on the website and is updated whenever new shapes are added. 5. HOW DO I START? Order and download the free shape collection and print your first shapes in the next few minutes! See the clues for the Case of the Secret Garden (COTSG) on the All About Inklingo blog. It's perfect for Inklingo beginners.